As the chief executive of an ecommerce agency, Indaba Group, I am often asked by partners, employees, prospects and customers to provide insight on the ecommerce landscape and what trends I see shaping the industry. Licensed – A license for a platform built by a third-party vendor and maintained internally or by a Solutions Integrator (SI) usually hosted on premise or with a 3rd party hosting vendor. Software as a Service (SaaS) – A subscription-based solution that is built and maintained by a third-party vendor and may be hosted in the “cloud.” Customizations and integrations may be handled internally or by an SI. With the pace at which the online industry is moving, let’s face it, today’s great sites will be considered antiques within the next five years. That’s an important consideration when estimating your Total Cost of Ownership (TCO) for your ecommerce platform. I recommend setting a course for three to five years. When estimating costs, remember to include all upfront costs (e.g., design and development costs, deployment costs), as well as ongoing maintenance of the platform (ongoing design and development costs). Remember to include the cost of your own internal resources involved in all of these calculations, too. The leading licensed solutions usually charge an annual license fee based on some sort of usage metric. For example, Magento charges license fees on a per-server basis. Therefore, as your ecommerce business becomes more and more successful in the short and long term, you will have to scale your server capacity and incur higher overhead as a result. Additionally, you’re responsible for redundancy. You’ll need to pay for those benchwarmer servers to sit idle in case they’re needed during an unexpected spike, and you’ll likely be hit for yet more license fees for this increased usage of the licensed platform. You’ll need a team of skilled developers to architect, build, configure, customize, integrate, test, deploy, support, maintain and enhance the platform. Furthermore, you’ll need a team of skilled developers to architect, build, configure, customize, integrate, test, deploy, support, maintain and enhance the platform. You may choose to grow an in-house team (read: expensive) or outsource these efforts to a reputable Solutions Integrators (read: hard to find without getting burned repeatedly). Perhaps your organization doesn’t have the ways or the means of assembling and putting to work an effective technical team –– in-house or outsourced –– to develop and maintain a platform. Or maybe you want to deploy those resources elsewhere. If so, you should consider outsourcing the design, building and maintenance of the platform to a SaaS provider for a monthly subscription fee. Research has shown that, over a four-year period, the TCO of SaaS solutions can be nearly 50% less than those built in-house or licensed from a third party. Most retailers have as many as 15 different backend technologies in their data center that work together to power their site. Your ecommerce platform doesn’t operate independently from the rest of your business’ tools and systems, which may include ERP (such as Jagged Peak, Oracle, SAP, Epicor, MS Dynamics), CRM (such as Salesforce, Sugar), Order Management Systems, Shipping and Fulfillment platforms, Email Integrators (such as Listrak), Tax tools (Avalara), or Analytics and Optimization tools (such as Optimizely). It is critical that your ecommerce platform integrates as seamlessly as possible with all of the tools and systems you are using to operate your business successfully. If you’re headed down this path, establish that you have suitable resources at your disposal in order to build and maintain your site. In other words, make sure you have an SI and/or an IT team that can utilize a licensed API to generate a custom integration. Modern licensed platforms will provide APIs with which you’re in-house IT team or system integrators will need to become familiar. But remember, you likely won’t get any support from the platform vendor if it even remotely appears that your integration interfered with the core of the platform. Therefore, your only recourse is with your development team should you need to investigate, diagnose and fix any problems on the integration. There is a misconception in the industry that licensed ecommerce solutions are more customizable in terms of integrations with other systems. True, licensed solutions offer robust abilities to customize via integrations, but SaaS platforms are quickly closing in on that competitive advantage. Licensed solutions offer robust abilities to customize via integrations, but SaaS platforms are quickly closing in on that competitive advantage. As with the licensed model, SaaS solutions provide APIs, allowing the necessary hooks for integration needs. Any integration efforts on the SaaS approach will require development time, so having the right team in place is critical. Ecommerce companies need to be able to craft a site that is both unique and user friendly. That’s basic. 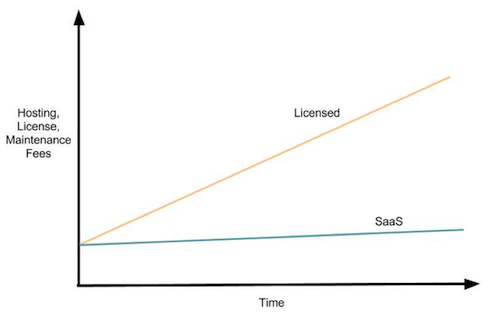 So, when deciding between licensed and SaaS, what you really want to be focused on is whether your platform can continue to support your desired enhancements to the site. A strategic online merchant is always testing their site to improve conversion rates. You’ll want a flexible platform that enables you to move on A/B testing, for example, with speed and efficiency across all devices (i.e., mobile, tablet, desktop). Fortunately, both the licensed and SaaS platforms we work with offer very flexible front ends, enabling your marketing and development efforts to be as effective as possible. Having your site handle an average day’s traffic is one thing, but you need to ensure your platform can also scale. It needs to be able to handle business growth over time, as well as respond in an instant to a traffic spike. Not only do you want your site to stay “up” during times of high traffic, it needs to continue to load quickly. You’ll need to consider the database redundancy, separate admin servers, server optimization and upgrades. You must make sure your hosting provider has the capacity to serve a surge of customers, particularly if you run heavy promotions that target individual customer segments or if your business model is based on timed/flash sales. In anticipation for planned and unexpected traffic spikes, it’s wise to provision additional servers with a load balancer and conduct periodic load-testing. In anticipation for planned and unexpected traffic spikes, it’s wise to provision additional servers with a load balancer and conduct periodic load-testing. Ensure you have the adequate time, attention and budget to allocate to these efforts. Think about it, how much would four hours of zero sales have cost you during your last peak? As I’ve already mentioned, maintaining a fully redundant, optimized environment of servers can be very impractical and cost-prohibitive for many merchants. Good SaaS solutions are constantly prepared to handle surges in site traffic by taking on this burden for you by being responsible for their own highly available, secure and robust server infrastructure. Ultimately, for you as a merchant, you can enjoy freeing up your time and budget to focus on your business and revenue-driving efforts. Research shows that the hidden factors of implementation — such as preparing data for the new system, importing data, establishing process changes, configuration management and training staff and any external partners — can often take up most of the time required to set up a new platform. Development efforts also include dealing with the challenges of data sanitation, importation management and ongoing refinement of that data. Don’t forget to include these costs in your TCO calculations. While there are still the same data challenges with SaaS as there are with licensed approaches, great SaaS vendors are committed and invested in ensuring you’re a long-term customer. This means that their support teams (and SI partners) go the extra mile to help you implement their solution efficiently and effectively. SaaS have a distinct edge over the licensed solutions available today due to their ability to respond to market trends in a much more agile fashion. In fact, I’ve noticed in the last nine to 12 months that the customer service and automatic upgrades rolled out to all SaaS customers have meant that I consider SaaS to have a distinct edge over the licensed solutions available today due to their ability to respond to market trends in a much more agile fashion. Choosing the right ecommerce solution is a big decision, and not one that should be made in haste. Start with these five things when weighing your decision, and don’t be afraid to ask your vendors plenty of questions.